I love gazpacho. There's nothing more refreshing on a hot summer's day than a bowl or mug full of chilled vegetable puree flavored with a bit of acid and garlic. And it's pretty easy to make, if you have a blender. We bought one of those mega-packs of strawberries a couple weeks ago and I was worried that we might not be able to eat them all before leaving town for a few days. 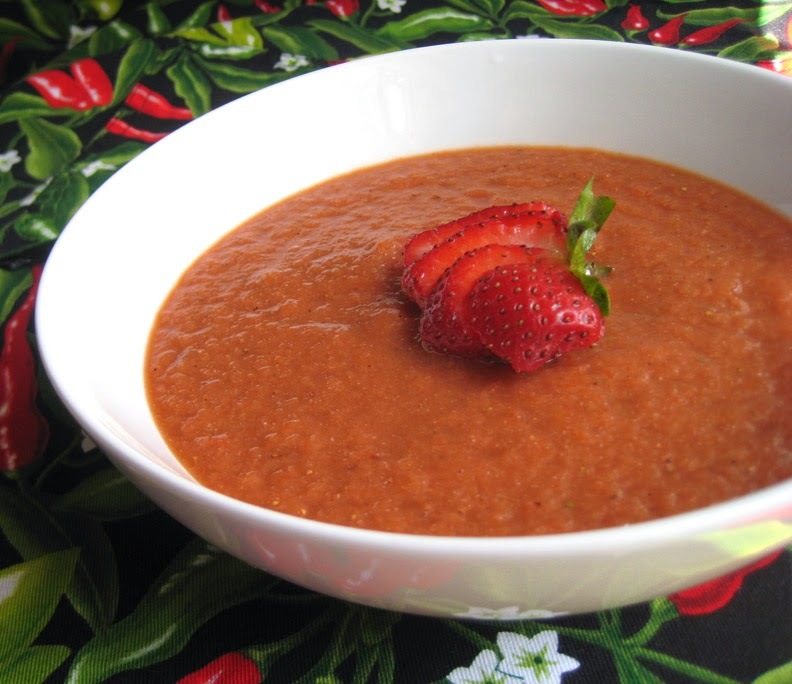 Then I got the idea to substitute strawberries for the tomatoes usually found in gazpacho. It looked pretty much the same, but the soup had a lightly sweet and definitely strawberry flavor. And boom! No more strawberries in the fridge. If your strawberries are very sweet, you might not need to add any additional sweetener. Combine cucumber, strawberries, pepper, and garlic in a blender and puree. Season with the vinegar and lime juice, adding sugar, salt, and pepper to taste. Transfer soup to a bowl or resealable container and refrigerate at least two hours until the flavors have had time to blend.